An outsider within her Jersey Shore family, Chef Rossi finds a home for her punk sensibilities inside the kitchen. When their high-school-age, punk, runaway daughter is found hosting a Jersey Shore hotel party, Rossi's parents feel they have no other choice: they ship her off to live with a Hasidic rabbi in Crown Heights, Brooklyn. Within the confines of this restrictive culture, Rossi's big-city dreams take root. Once she makes her way to Manhattan, Rossi's passion for cooking, which first began as a revolt against the microwave, becomes her life mission. 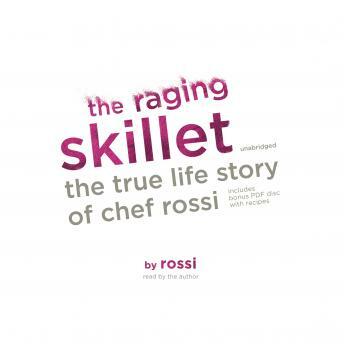 The Raging Skillet is one woman's story of cooking her way through some of the most unlikely kitchens in New York City-at a "beach" in Tribeca, an East Village supper club, and a makeshift grill at Ground Zero in the days immediately following 9/11. Forever writing her own rules, Rossi ends up becoming the owner of one of the most sought-after catering companies in the city. This heartfelt, gritty, and hilarious memoir shows us how the creativity of the kitchen allows us to give a nod to where we come from, while simultaneously expressing everything that we are.